Call (850) 434-1523 for your trophy engraving needs! Welcome to Benton's Trophies and Engraving, Pensacola, FL's top trophy shop. We offer trophy engraving for the perfect personalization. Bentons offers numerous options for the perfect award trophies to suit your needs. Looking for trophies for your sports team? Maybe you need name tags for your company employees. Looking for that special award plaque for an accomplished employee? Or maybe you need a simple engraved plaque to put on a special gift for someone. Benton's Trophies and Engraving in Pensacola, FL has it all! We offer acrylic awards, glass awards, name tags, plastic signs, ribbons, metals, custom engraving, custom built trophies clocks, desk accessories and much more. Personalize anything with our trophy engraving services! Our store is a one stop place to shop for trophies and awards! Our Trophy Shop offers beautiful award trophies to suit your needs! We have trophy awards available for any sport including ribbons, medals, statues, and coaches awards. Everyone loves to read the awards and plaques on the wall at work or in the school hallway. Then they imagine their own name on that award. It is a great incentive to any individual or team player to be recognized by their peers for their outstanding achievements. Teams that play in public places, on ball fields, at swim meets, or any other sporting event like to see their team advertisements visible so everyone watching them knows that they are a part of the team. 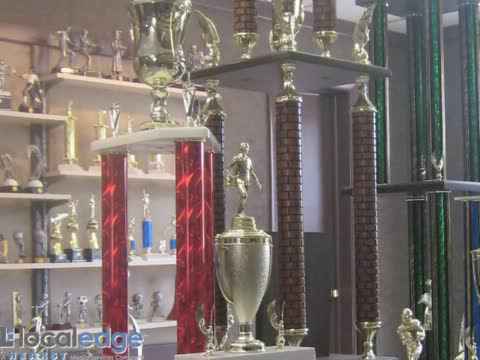 When it is time to buy a sports trophy or a custom trophy, come back and check out Benton's Trophies and Engraving before any other trophy shop and you will be surprised how inexpensive awarding your team or someone exceptional in your office can be. We have some of the finest award trophies available and at reasonable price. It really helps add incentive to any team player when they know they may be eligible for an award. Our company has been in business for over 40 years serving the Pensacola area. We pride ourselves in customer satisfaction. We aim to get your order perfect the first time and get your customized products to you as quick as possible! Come visit the largest trophy and awards showroom in Pensacola FL!